In 1836, the British military officially adopted the percussion cap to replace flint as the ignition system for small arms. However, it would be 1839 before a new infantry musket using the percussion system would be officially approved and start to be issued in any quantity. 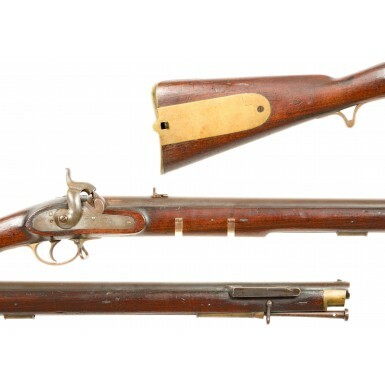 With the theoretical acceptance of the new ignition system, George Lovell, inspector of small arms at Enfield (the British government armory), proceeded to start the process of designing a new percussion musket and rifle. 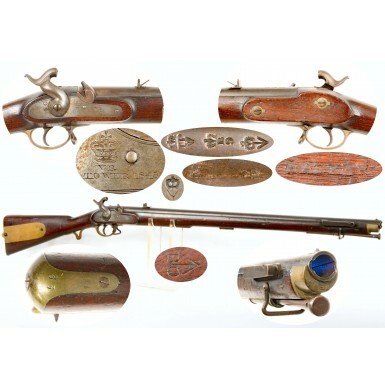 His initial success was in a back-action percussion lock that was see only limited use on his short-lived Pattern 1838 musket design, but which saw significant service with the newly designed Pattern 1837 Brunswick Rifle. The Brunswick Rifle was a significant technological improvement over the Baker Rifle that had seen use in the British Rifle brigades and battalions for more than three decades. The Baker was a flintlock rifle with a slow twist, seven-groove, barrel. The rifling design had been selected not so much for accuracy, but for its ability to see significant use without becoming too fouled to load. In fact, the accuracy (or rather inaccuracy) of the rifle was such that during the last years of production the multi-leaf rear sight was abandoned for a fixed sight, with the Board of Ordnance feeling that the adjustable sight was unnecessary for the rifle or the rifleman! Lovell experimented with a variety of rifling systems for what would become the Brunswick Rifle, and finally settled upon a 2-groove bore of .704 caliber that used a patched, belted ball to insure a tight mechanical fit between the ball and rifling. The new rifle resembled the older Baker in that it did not employ barrel bands, but rather had a key fastened stock and had a heavy bar on the right side of the barrel for the mounting of a saber bayonet. 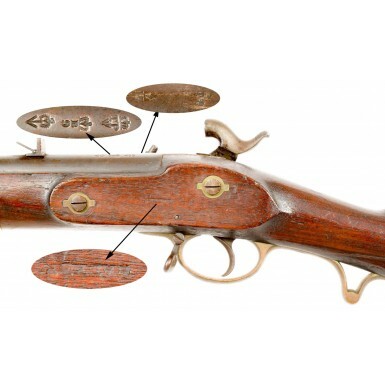 The First Model of the Brunswick, the Pattern 1837, had Lovell’s back action lock, a fixed sight that was graduated for 200 yards with an additional leaf for longer range shooting, graduated for 300 yards. The rifle also utilized a hook breech and a barrel made from “twist steel”. The gun had a 30 3/8” long, round barrel, and was 46 ½” in overall length. The rifles had color casehardened locks, browned barrels and walnut stocks with brass furniture. The buttstock included a large brass patchbox, which was designed to store both lubricated patches and gun implements. A pair of brass ramrod pipes were located in the ramrod channel, the upper most one with a flared mouth. The brass triggerguard had a skeletonized, semi-pistol gripped extension to its rear, and a sling swivel mounted on the forward portion of the guard bow. An upper sling swivel was secured through the stock just forward of the upper ramrod pipe. 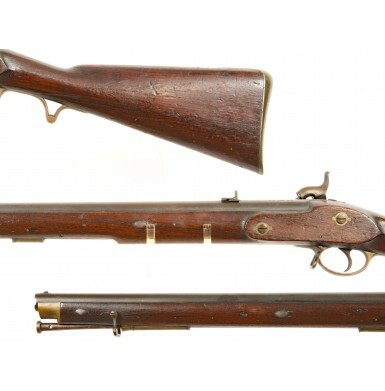 The First Model Brunswick Rifle (Pattern 1837) went into production in 1838, with the earliest deliveries of the rifles to troops in the field being around 1840. In 1841, an improved version was adopted with a conventional front action side lock. 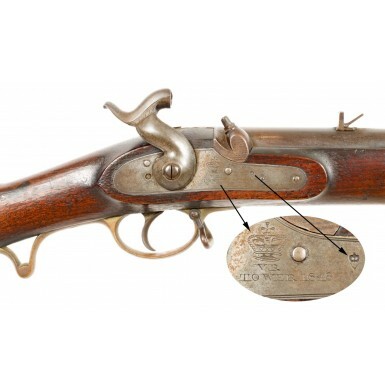 The Second Model Brunswick Rifle also eliminated the hooked breech from the initial design, replaced the “twist steel” barrel with a plain iron barrel and shortened the barrel’s overall length to 30”, primarily the result of eliminating the hook breech. This brought the overall length of the rifle down by a similar amount, resulting in a nominally 45 ¾” long gun. 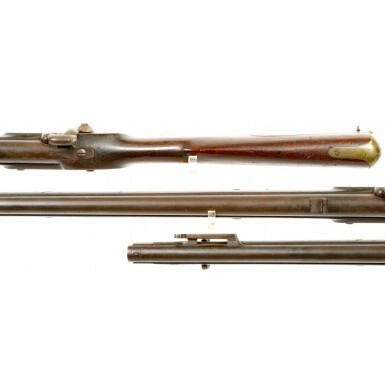 These second pattern rifles, adopted in 1841, went into production around 1844 and were in the field the following year. 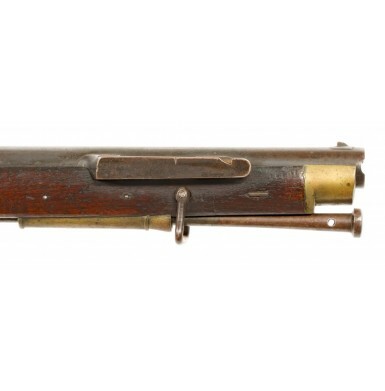 As such, most collectors refer to the improved Second Model Brunswick Rifle as the Pattern 1844. The final change came in 1847, when Lacy & Reynolds, a London arms contractor, introduced an improvement to the bayonet mounting bar. This changed the location of the notch in the bar that mated with the catch in the bayonet. On all earlier rifles the notch had been near the front of the bar. The Lacy & Reynolds improvement moved the notch more towards the middle of the bar, strengthening this part that was somewhat prone to breakage. Once the new improvement was officially adopted, the final version came into being. 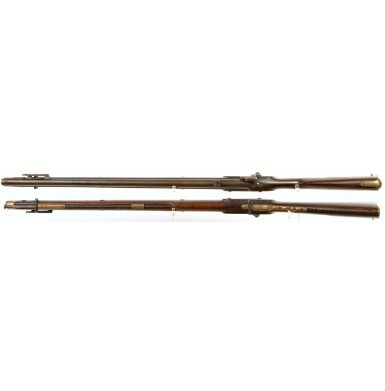 While really the Second Model Brunswick Rifle (2ndVariation), these guns are often referred to as Pattern 1847 rifles. The Brunswick Rifle remained a standard issue long arm for all rifle troops (rifle regiments, rifle battalions, Royal Canadian Rifles, etc.) until about 1853, when sufficient quantities of the new Pattern 1851 Minié Rifles had been produced and could be issued, effectively turning all British infantrymen into “riflemen”. 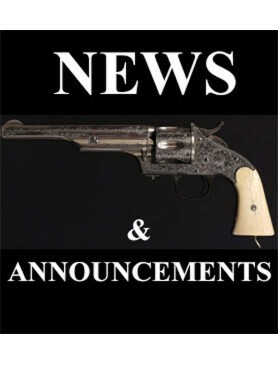 Even after the adoption of the small-bore .577 caliber Pattern 1853 “Enfield”, the Brunswick remained in a secondary issue roll, particularly among native and colonial troops, through the mid-1860s. The Brunswick Rifle was being withdrawn from service as the British entered the Crimean War, and it is likely that the rifles saw little service during that conflict. However, the obsolete design did see use during the American Civil War, as approximately 1,400 of the surplus rifles were sold to the Confederacy by the London firm of J.E. Barnett & Son, through S. Isaac, Campbell & Company. 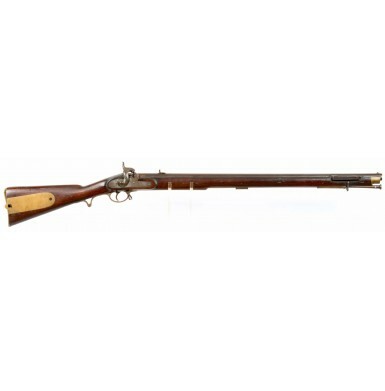 Offered here is a VERY FINE condition example of a Second Model (Pattern 1844) Brunswick Rifle. 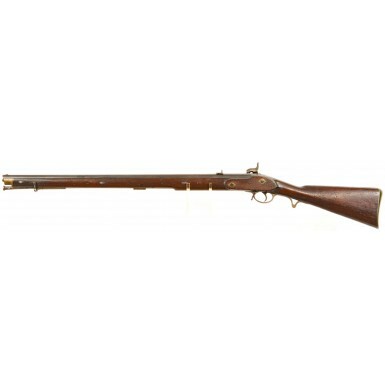 The gun is a first variation, British military marked Pattern 1844 Brunswick rifle, with the original 1837 style bayonet bar, forward action lock of the Pattern 1841/44 rifle, a 30 1/8” 2-groove .704 caliber barrel (with .760 grooves), the standard two-leaf rear sight and the usual large brass patchbox. The gun remains in 100% complete, correct and original condition throughout retains some strong traces of original finish. The lock retains some traces of its original mottled case hardened finish and is crisply engraved (CROWN) / VR in front of the hammer over the marking TOWER 1848. The small British military (CROWN) –> inspection and government ownership mark on the lock is crisply struck as well. 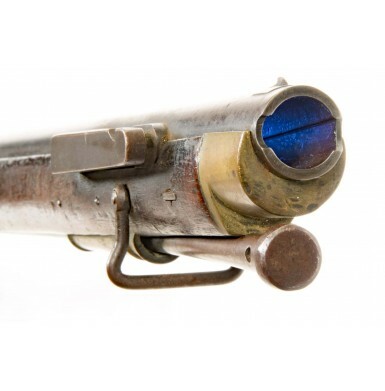 The breech retains very crisp and clear British military proof marks, including a TP -> and (CROWN) / 17 inspection on the top and a (CROWN) / TP / –>over a (CROWN) / B / 9 and (CROWN) –> along the left edge of the breech. A very crisp and clear B O / (BROAD ARROW), Board of Ordnance Storekeeper’s mark is present in the obverse stock, forward of the patchbox. The interior of the lock is marked with a variety of crowned number inspection marks, as is usual with British military percussion arms. The counterpane of the stock is stamped with the name WALKER. This probably the mark of Birmingham gunstock maker William Walker, who was part of a multigenerational family of gun stockers. 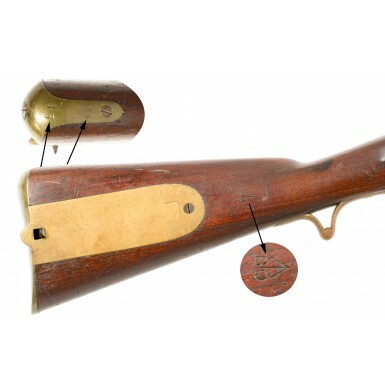 The buttplate tang of the rifle has the issue or rack number 33 stamped at the rear of the tang and the number 14engraved near the front of the tang. As previously note, the rifle is in about VERY FINE condition. It retains about 30% of the original blue on the barrel, which has thinned and faded and blended with a very attractive plum brown patina. All the markings are extremely crisp and sharp, and the gun shows no indications of every having been refinished or refurbished. The barrel remains mostly smooth, showing only some very lightly scattered areas of pinpricking, as well as some scattered patches of minor surface oxidation. The bore is in about FINE condition as well and remains mostly bright and crisp with very strong and deep 2-groove rifling. The bore shows no real pitting but does show some scattered pinpricking and some scattered oxidation, primarily in the grooves. The lock is mechanically excellent and functions perfectly on all positions. The rifle retains both sling swivels, which appear to be original, as well as its original two-leaf rear sight. The original bayonet mounting bar is present on the right side of the barrel as well. The original Brunswick pattern rammer is in the channel under the barrel, and it is full length with good female threads on the end, like those found on the Pattern 1856 cavalry carbine rammer. The rod is inspected with a (CROWN) / B / 2. The brass furniture is in very nice condition with a rich golden patina that is uncleaned and very attractive. The stock is NEAR EXCELLENT condition overall. The stock is full-length, solid and free of any breaks, cracks or repairs. The stock remains extremely crisp and sharp throughout, retaining fine, crisp edges and marks and showing no indication of sanding. The stock does show a scattered array of minor bumps, dings and slight surface mars from handling, storage and use that are certainly expected from a rifle that is nearly 170 years old. Overall this is a really wonderful example of a very high condition British military Second Model (Pattern 1844) Brunswick Rifle. The gun is in really wonderful condition remains very attractive with a wonderfully untouched appearance. 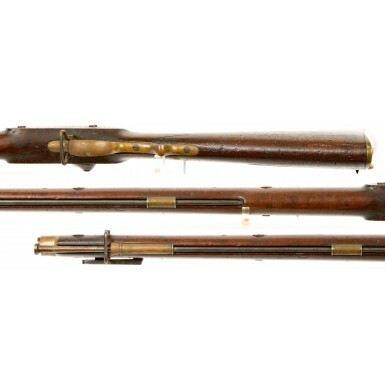 This is an extremely crisp example of the last of the British Rifle Regiment rifles and would be a fine addition to any collection of 19thcentury British military arms.